Behind the heated debate in Brussels about climate and renewable energy targets, what is really happening is that concern over high energy prices has taken precedence over climate concerns in Europe. Competitiveness has caught up with climate policy. 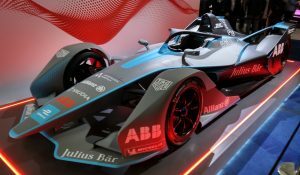 Indeed, the two issues have become so intertwined that when the European Commission will present its new climate and energy policy on 22 January, it will at the same time launch a new industrial policy. Similarly, EU leaders, who were to meet twice in February and March to discuss energy prices and climate policy separately, have merged these meetings into a single summit to address both issues at the same time. Our correspondent Sonja van Renssen digs behind the climate and energy headlines. EU climate commissioner Connie Hedegaard and energy commissioner Günther Oettinger still don’t agree on what greenhouse gas emission reduction target the EU should adopt for 2030. Hedegaard wants 40%, Oettinger 35%. This is the news that emerged from a deadlocked meeting within the Commission on 10 January that was supposed to agree the 2030 proposals internally. Many believe that 40% will prevail. If it does, it is also the only target the Commission is likely to propose: forget a new renewables target – if there is one at all it will be non-binding and less than 30%, which, according to the Commission’s own Commission’s own new 2013 reference scenario, published over Christmas, is really nothing more than business as usual. 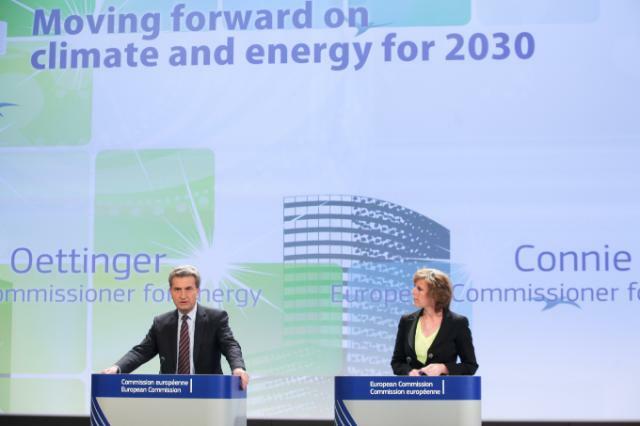 A new energy efficiency target long ago disappeared from the Commission’s agenda. Thus, the famous 20-20-20 targets for 2020 will not get a proud sequel for 2030. This despite the European Parliament’s vote on 9January in favour of three binding targets for greenhouse gas emissions (40%), renewables (30%) and energy efficiency (40%). Despite the fact that on 23 December, Ministers from Germany, France, Italy, Austria, Belgium, Denmark, Ireland and Portugal sent the two Commissioners a letter urging them to retain a renewable energy target in addition to a reduction target. Despite the letter by Germany, the UK, France and Italy last week urging a 40% climate target. Despite also pressure from the renewable energy sector and parts of industry to maintain an ambitious climate and renewable policy. The truth is that at this moment many member states and industry fear that a strong climate and energy policy will be bad for their economies. If in an interview with Energy Post last December, Hedegaard still insisted three binding targets were needed, today she is fighting to defend her 40% emission reduction target. 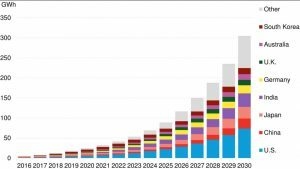 The Commission’s 2050 low-carbon roadmap says this equates to the most cost-effective path to an 80-95% emission reduction in 2050. In contrast, 35% is only just above business-as-usual – a 32% decrease in emissions in 2030 – according to the Commission’s new 2013 reference scenario. The debate within the Commission is over an un-ambitious vs. very un-ambitious climate and package that ignores the findings of its own impact assessment, critics say. The critics have a point. The truth is that at this moment many member states and industry fear that a strong climate and energy policy will be bad for their economies. 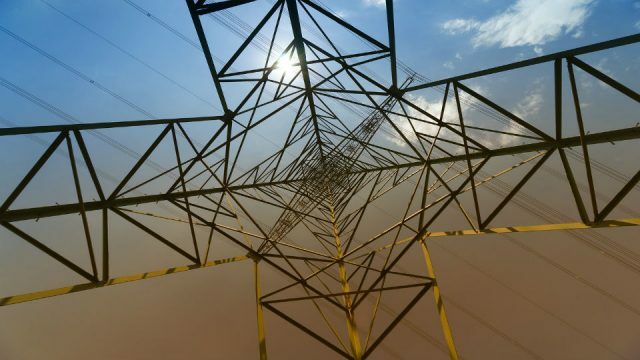 Relatively high energy prices in Europe compared to the US which benefits from its shale gas boom plus the economic recession have forced their way into the heart of the 2030 climate and energy debate. Consider that EU leaders were due to meet twice early this year: in February, to discuss energy prices and competitiveness, and in March, to discuss climate policy. 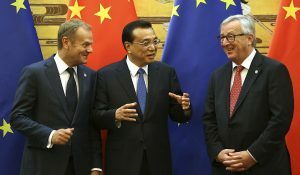 The two have now been merged into a single summit on 20-21 March in line with EU policymakers’ wish “to be coherent”, according to a Commission source. 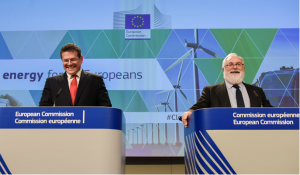 In addition, it now appears that on 22 January – long pencilled into energy journalists’ diaries as D-Day for the 2030 climate and energy package – the European Commission will also launch a new industrial policy for Europe. Indeed, it may launch the two with a single press conference! Although policymakers recognise that competitiveness is not determined by climate policy alone, the fear is that EU climate and energy policy may be the straw that breaks the camel’s back. European industries have been claiming this for some time. Several of them were prioritised by the Commission for a “fitness check” or “cumulative cost assessment” to work out how much EU climate policy is actually costing them. The results are gloomy: EU climate and energy policies have raised the cost of producing a tonne of aluminium by as much as 11% (€228), reported the Centre for European Policy Studies (CEPS) last autumn. Just before Christmas, it announced that European steel companies pay twice as much for electricity and four times as much for gas as their US counterparts. These sector-specific conclusions appear to be borne out by a leaked draft of a report on energy prices seen by Energy Post. This paper is also due from the Commission on 22 January. Bearing in mind that the draft appears an early version, it nonetheless suggests that the findings for steel are on average true for all industrial and retail consumers in Europe. From 2005-12, European industrial consumers faced real price rises of 40% for electricity and 30-35% for gas, even as prices went down in the US and grew more slowly in other parts of the world. EU climate policy has been an easy scapegoat. But the report also points out that these are average figures that hide an extremely diverse picture across Europe. According to the report, prices in different European countries can vary by a factor of 3-4. In 2012, industrial electricity prices were below the weighted EU average in 18 member states, comparable to prices in Turkey, Mexico, Brazil and China. In Romania, electricity prices have actually decreased since 2007. In Germany, energy-intensive industries are exempted from carbon and renewable levies plus grid access fees; similar exemptions exist for industries in other countries. Felix Matthes the Öko-Institut recently argued that German industry pays about the same for electricity as in the US. In the aluminium sector, about a third of all plants still buy electricity through long-term contracts, which mean they have seen just one-tenth of the cost increase of plants exposed to market prices. (Though many of these are due to terminate soon and may not be renewable under EU competition law.) Finally, despite the clear price difference with the US, there is no sign of EU industry doing less well on EU and US markets, concludes the prices report. Yet energy is getting more expensive in Europe compared to the rest of the world and this threatens at least some industries. The question is what to do about it? EU climate policy has been an easy scapegoat, with much mudslinging at the EU Emission Trading Scheme (ETS), which makes industry pay for its carbon emissions. But the Commission has so far found no evidence of “carbon leakage”, i.e. industry leaving Europe for regions with looser carbon constraints. Yes, some industries are looking elsewhere, but this is “driven mainly by global demand developments, and input price differences”, according to yet another report from the Commission. And yes, says this report, energy prices are going up, but carbon costs are not a major factor. (This may also be because of the leakage protection measure – extra free allowances – in place so far). Instead, the biggest problem is the commodity price of fuel. The draft energy prices report shows that this typically makes up the bulk of energy prices, followed by taxes and network charges. The gas price is something policymakers can partly do something about, for example by working to complete the single European energy market. What they can do much more about however, is taxes. The share of tax in the total energy price for industrial consumers can be high in Europe, while in the US, China, and India there is no taxation on natural gas and electricity for industry. Moreover, the tax component increased by more than any other in recent years, says the Commission in its prices report. But taxes are primarily a national, not European, competence. Untangling the causes of high energy prices does not answer the question of how to deal with them, however. Interestingly, in its draft prices report, the Commission suggests that European energy-intensive industry has been able to hold its own so far in part because it has decreased its energy intensity (defined by the Commission as the amount of energy consumed to produce a unit of value-added of one million Euros). In contrast, US industry has started consuming more with the arrival of cheap shale gas. It also says Europe has been helped by restructuring away from energy-intensive sectors, although it maintains an overall share of manufacturing in value added above that of the US. It is alarming that apparently industries that depend on energy efficiency legislation are leaving Europe. “In many cases decreasing energy intensity could mitigate the impact of increasing energy prices,” the Commission suggests. This suggests that a strong policy push for efficiency makes competitive sense. Greater efficiency and technological innovation are essential to a healthy European industry. 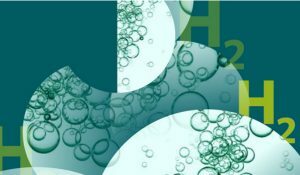 The European paper industry, represented by CEPI, has become one of the first to embrace this with an innovation competition last year. Viewed in this light, it is alarming that apparently industries that depend on energy efficiency legislation are leaving Europe. “If words were action in the field of energy efficiency, then I would be opening new factories in Europe but as they are not we have just closed a factory in Italy and are planning to open three new plants in the US, Asia and Turkey,” wrote the CEO of Knauf Insulation, Tony Robson, to Barroso on 9 January. Competitiveness is also about preventing low-carbon leakage. It is also about maintaining an expanding cleanteach industry. Policymakers cannot ignore high energy prices and the risk of carbon leakage of course, but a failure to maintain a strong climate, renewable energy and energy efficiency policy may not be the right remedy. It may hurt Europe’s growing green sector while doing little to reduce energy prices for industry. “What they can do much more about however, is taxes. The share of tax in the total energy price for industrial consumers can be high in Europe, while in the US, China, and India there is no taxation on natural gas and electricity for industry”. Simple solution. Convert all taxes on fuel for industry into carbon taxes. Institute border carbon taxes on products coming in from other countries. This approach is expressly permitted by the WTO (see report 2010 July I think on the subject). This would make things much more equal. It will not happen because although the French have long wanted it, although it has been shown to be econometrically sound (Helms et al) the addiction to marketism ideology (= markets have all the solutions) mostly a UK disease but seemingly swallowed by others including Manuel will prevent this. All in all one word sums up the EC approach: pathetic.